Join the Südkurve in London and meet Red Dragons London at every match in their place of choice – the Red Dragons’ Lair – the Bavarian Beerhouse. There are two branches of the Bavarian Beerhouse in the city, and our main gathering point for Saturday matches and Champions’ League and DFB-Pokal games is that the branch in Old Street. For Sunday Bundesliga games, the Red Dragons can be found at the branch in Tower Hill. In many Bierkellers and Kneipen across Germany, you will often find the Stammtisch – a table where familiar faces come together for an informal gathering. Loosely translated as “gathering of regulars”, the Stammtisch is often the focal point of the establishment where most of the interesting conversations take place. At the Bavarian Beerhouse this is no different, and us Red Dragons have our own Stammtisch in both London branches. We don’t have one fixed table, but do have an arrangement with the Beerhouse where we can decorate a reserved table in our distinctive red and white livery and make ourselves stand out from the rest of the busy crowd! 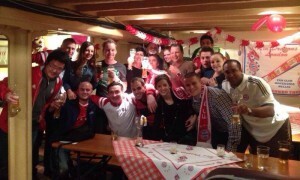 The Red Dragons’ Stammtisch. Hier regiert der FCB! 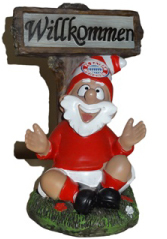 As a fan of FC Bayern, when you join our Stammtisch you will immediately feel right at home. Everyone at the Stammtisch lives and breathes Rot-Weiß, and you will find people of all ages and a mix of different nationalities, illustrating the fact that FC Bayern is a popular club loved by many people from all corners of the globe. Within moments of your joining us you will be quickly into the conversation, whether it is about last week’s match, their favourite player, an obscure DFB-Pokal first round match from 1994 or the latest FC Bayern Trikot. At the centre of things you will find the members of the fan club board. Seppl das Schwein… Immer hungrig! Please note that our Stammtisch is reserved for members only and that seat reservation is by invitation only. As a member of the Red Dragons London you are able to bring a guest, but please do let us know in good time so that we can arrange the numbers appropriately. This is massively important on big match days when the entire room is transformed into a loud seething mass of red and white! 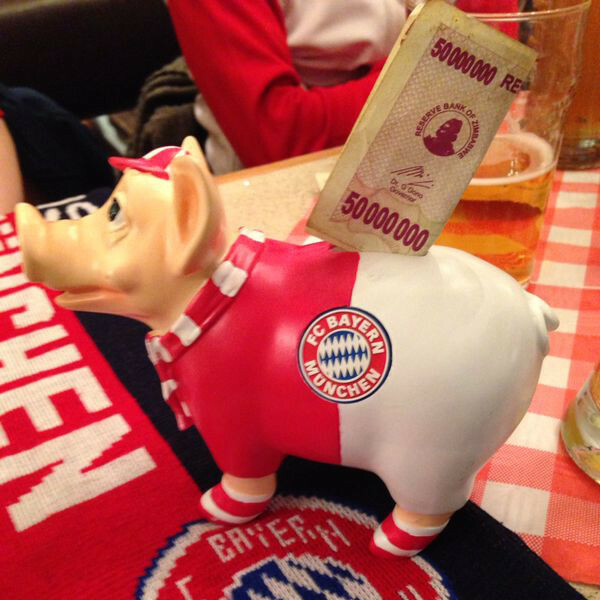 There is no additional fee for guests, but you are encouraged to feed Seppl das Schwein (Seppl the pig, our tabletop mascot) with a few coins just keep him happy – after which you should rub his Schnauze for good luck! On busy match days where there is an entrance policy, you will need to show your Red Dragons London membership card (included in your membership pack) at the door. Of course – and this goes without saying – FC Bayern colours only! To get a good idea of the pulsating atmosphere at the Red Dragons’ Stammtisch, just have a look at this very short clip following the 2014 DFB-Pokalfinale against Borussia Dortmund. Need we say more? In joining the Red Dragons London, you can be a part of it!